Therese Patricia Okoumou, who climbed the base of the Statue of Liberty on July 4th in protest of racist immigration policies, subsequently causing park officials to evacuate 4,500 people from the island for “security concerns”–because an unarmed woman on a statue is a public safety hazard–showed up to her court hearing on Friday in a dress reading “I REALLY CARE WHY WON’T U” and “BE BEST” on the back of it. 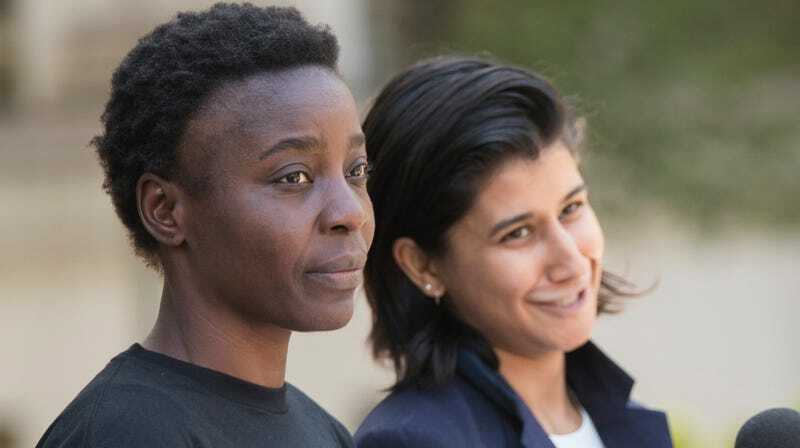 Okoumou, who is reportedly a naturalized U.S. citizen from the Democratic Republic of Congo, has pled not guilty to trespassing, interference with government agency functions and disorderly conduct. Okoumou is a member of the activist group Rise and Resist, which unfurled an “Abolish I.C.E.” banner at the bottom of the statue (but was not associated with her climb). In a statement from the Department of Justice, U.S. attorney Geoffrey Berman called the climb “a dangerous stunt that alarmed the public and endangered her own life and the lives of the N.Y.P.D. officers who responded to the scene.” They used a ladder, photo here. I submit that an individual who breaks the law their conscience tells him is unjust and who willingly accept the penalty of imprisonment in order to arise the conscience of the community of its injustice is in reality expressing the highest respect for law. In conclusion, the Statue of Liberty climb was terrifying and alarming and it is comforting to know that the action will be brought to justice.